WORLDWIDE: High yields at low speeds is the objective for wind-turbine manufacturers and the larger the rotor diameter the better. A prominent theme of this year's European Wind Energy Association (EWEA) conference in Copenhagen was the need to substantially drive down the cost of energy, the cost of generating a kilowatt hour of energy calculated over the entire lifecycle of a wind project. A growing number of turbine suppliers are introducing models with a modest-sized generator and a large rotor diameter. Higher towers onshore are also a hot focus. A number of technology advances were launched at the conference. Spain's Gamesa introduced a 2MW model with a 114-metre rotor diameter for low and medium wind-speed sites, with a specific power rating (or P/A, the ratio between the nameplate power rating and the rotor swept area) of 0.20kW/m2. The turbine claims 3,819 full-load hours at 6.5 metres per second (m/s) average wind speed, which is about double the full load hours achieved by 2MW models ten years ago. The higher output helps to achive a lower cost of energy. Gamesa is targeting the product at wind markets with poor wind sites, insufficient or non-existent financial-support mechanisms, or where grid connections are limited such as those in parts of China. In parallel, the company is reconsidering the rotor size of a planned 4.5MW turbine. The company perhaps already considers the enlarged 136-metre rotor diameter (P/A = 0.31) too small. Another turbine featuring high yields at low speeds is GE's 1.6MW 1.6-100 model, with a P/A of 0.20. The US firm announced at the show that this turbine will now be available in Europe following huge success in the US. Stephan Ritter, GE's general manager of renewable energy in Europe, says that this model will be assembled in the German Salzbergen plant together with the 2.5MW and 2.75MW sister models. A new 2.75MW turbine with a 118-metre rotor diameter, mentioned in a 2011 company presentation seems likely, though the company has not officially commented. GE is expected to take the next step in testing the 4.1MW offshore turbine with five to 15 units in the water. The company has focused heavily on enhancing the reliability of this product in order to reduce downtime and therefore costs. Prior to the conference, Nordex's new CEO, Jurgen Zeschky, had announced that the Germany-based firm would refocus on onshore markets. At the show, Zeschky said it is working on evolutionary advancements of the 2.4MW N117/2400 model for the onshore projects, including low wind-speed sites. Based on a mature existing platform, the cost of energy could be cut faster. A planned new 3-4MW medium-speed onshore turbine has been given reduced priority. Nordex has also ended plans to transfer its entire offshore activities to a joint venture. Instead, it will sell the offshore business assets, including a promising 6-6.5MW direct-drive turbine in development. The offshore business unit will be discontinued, despite only being established last year. Acciona of Spain has begun rollout of a 3MW geared turbine model with a rotor diameter up to 116 metres. These turbines can be offered with a novel segmented concrete tower up to 120 metres, which is suitable for manufacture in so-called mobile factories. Easier transport logistics and construction of the tower reduce costs. The 3MW turbines feature a 12kV doubly fed induction generator, which under certain conditions can eliminate the need for a medium-voltage transformer, cutting investment costs and transmission loss. Acciona is also working on a 6MW turbine platform for both onshore and offshore application, but no further details have been made available. Siemens of Germany is testing a segmented steel-shell tower design for hub heights over 100 metres, eliminating tower-foot size constraints and easing transport logistics and handling. 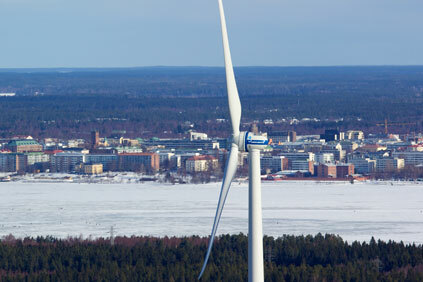 Mervento of Finland presented a 3.6MW direct-drive turbine with a rotor diameter of 118 metres for IEC WCII offshore and coastal onshore wind sites. The turbine includes design features such as a yaw system that operates with linear hydraulic cylinders similar to those used in heavy-duty cranes and excavators, and a cyclic pitch system without moving parts, based on helicopter technology. This has the potential to be more reliable than current yaw and cyclic pitch systems, improving cost of energy through reduced downtime. Meanwhile, Finnish firms Moventas and The Switch have introduced a highly compact medium-speed geared drive system called FusionDrive incorporating a permanent magnet generator. The 3-4.1MW FusionDrive 3 model is only three metres long for gearbox and generator, which can significantly reduce the length of the nacelle and therefore potentially the mass and cost of nacelle, tower and foundation. The first customer of the 3MW model is DeWind, a subsidiary of DSME of South Korea. The partners in future also plan a bigger 6-7.7MW FusionDrive 7. Finally, direct-drive turbine supplier Goldwind of China is reported to be testing a medium-speed model fitted with a locally made gearbox, a system denoted as "half direct drive", and using only about 20% of the rare earth metal elements of a direct drive model. Such is the cost of rare earth elements, that it may be more profitable for Goldwind to sell rare earths directly to the market than as part of a wind turbine, suggests a source. It was only two years ago when GE's introduction of a turbine with a small generator and very large rotor aimed at reducing the cost of energy was met with significant scepticism. Now this has turned into a major trend in the wind industry.